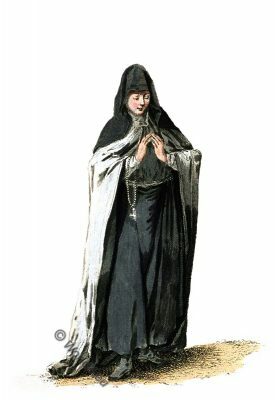 Home » Nun of the Order of St. Basil in her Choir dress. The Basilians of Saint Josaphat (Latin: Ordo Basilianus Sancti Josaphat, also Ordo Sancti Basilii Magni, abbreviation: OSBM) belong to the Basilians. They are affiliated to the Ruthenian Greek-Catholic Church and are integrated into the Ukrainian Greek-Catholic Church. The order was founded by Saint Josaphat Kunzewitsch (1580-1623). To him Pope Pope Pius XI dedicated in 1923 the encyclical letter “Ecclesiam Dei admirabili” underscored the great importance of the saint for the order of the Basilians but also for the Roman Catholic Church. The starting point of the Basilians of St. Josaphat goes back to St. Basil the Great (330-379), his way of life and the religious rules established by him have become the basis of the first monks on Ukrainian soil. The female branch was founded in the late 10th century as Basilian nuns by St. Basil the Great. At the beginning of the 17th century the metropolitan Benjamin Rutsky united several monasteries and entrusted the monks (now Basilian of St. Josaphat) with organizing their monastic life according to the Basilian order. As a result of the division of Poland and the territorial claims of Russia in Ukraine, a persecution of the Order developed. The distress of the Order lasted all the way to Austria. 1882 began under the direction of the Jesuits and by order of Pope Leo XIII. a restructuring of the Basilian Order. As a result, many monks were sent as missionaries to Brazil, Canada, the United States and Argentina. During the Soviet period, all provinces in the territory of Ukraine were annihilated. More than 350 monks were taken to Siberia, and the Basilians had to continue their activities underground and under the protection of the UGKK. After the collapse of the communist sphere of power, the provincials in Ukraine, Romania, Hungary and Slovakia were reactivated. Today there are 30 monasteries and 37 residences in these countries, and there are about 290 religious members in Ukraine. Meanwhile, the order had expanded in Canada, the United States, Brazil and Argentina. Today there are 31 monasteries with about 250 religious members. The Basilians are rectors of the Pontifical Ukrainian College of St. Josaphat in Rome and are responsible for Radio Vatican. Recueil des habillements de différentes nations, anciens et modernes, et en particulier des vieux ajustments anglois; d’après les dessins de Holbein, de Vandyke, de Hollar, et de quelques autres: avec une détail des sources & des autorités, d’où ces figures ont été prises; et quelques remarques historiques sur le sujet : auquel sont ajoutés les habits des principaux caracteres du théâtre anglois.